Honoring first Chief Rabbi's anniversary of passing, thousands of Jews gather on Mount of Olives to commemorate. 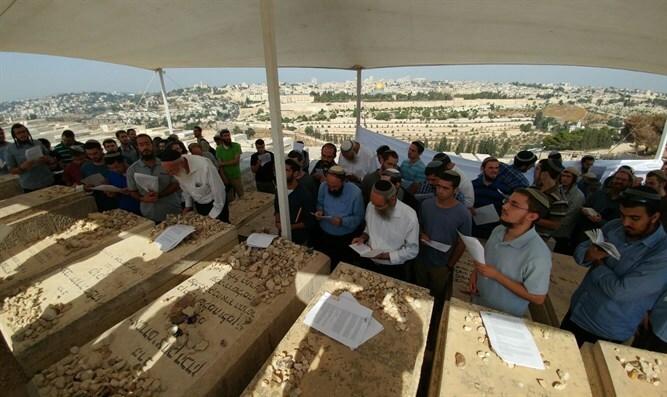 Thousands of Jews from all over Israel arrived at Rabbi Avraham Yitzhak Hacohen Kook's grave on Jerusalem's Mount of Olives, commemorating 82 years since his passing. Among the thousands of visitors were Beit El Yeshiva Dean Rabbi Zalman Baruch Melamed, Har Hamor Yeshiva Dean Rabbi Tzvi Tau, Deputy Defense Minister Rabbi Eli Ben-Dahan (Jewish Home), and other rabbis, students, and yeshiva deans. Rabbi Yaakov Shapira, dean of Merkaz HaRav yeshiva founded by Rabbi Kook is a cohen forbidden by halakha to enter a cemetery. The yeshiva had a memorial evening in Beit HaRav Kook in his memory. Born in a village in Latvia in 1865, Rabbi Kook received received rabbinical ordination from Rabbi Yechiel Michal HaLevy Epstein, the author of the Arukh HaShulchan at the young age of 19. That same year, he became engaged to the daughter of the Aderet, Rabbi Eliyahu David Rabinowitz-Teomim. She gave birth to a daughter, but died just a few years later. Thereafter, Rabbi Kook married her first cousin, daughter of the Aderet’s twin brother; she bore him two daughters and a son, the famed Rabbi Tzvi Yehuda Kook. Rabbi Kook was Israel's first Ashkenazic Chief Rabbi, as well as a rabbinic authority, kabbalist, and philosopher. He founded Israel's Chief Rabbinate, as well as the Merkaz Harav yeshiva in Jerusalem.